Jansport’s Eichorn 60 backpack is a fine representative of the Cloudripper Series it hails from. 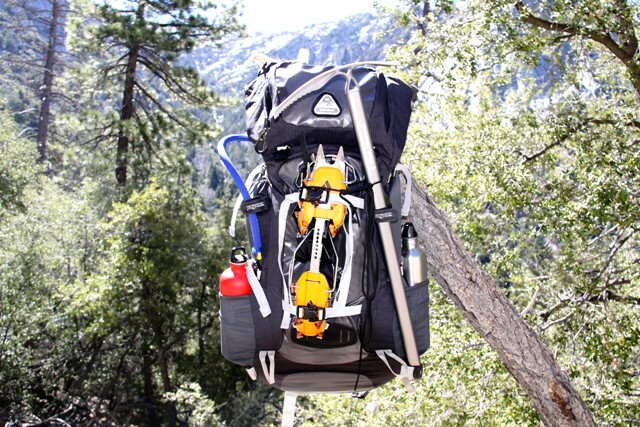 From the time we got hold of the grey tar/forge grey Eichorn 60, it has been on many single-day hikes and several overnight hauls into the high-country of the Sierra Nevada and San Bernardino National Forest. The Eichorn offers 3,661 cubic-inches of cargo capacity, or 60-liters. That’s enough room to have the essential gear for a two day trail romp, or single-day assaults to accessible mountain summits where you might need that down jacket, three-liter Camelbak hydration bladder, crampons, ice-axe, rope and food. On the overnight trips, our Eiechorn 60 weighed out to about 40-pounds. 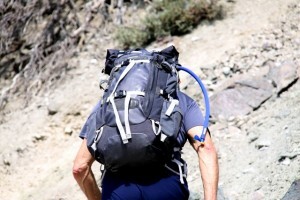 On day trips, the ever present Camelbak water bladder was aboard, plus more water, and an average of 20-pounds of gear. For short-duration treks that could end in a day, or extend overnight, the Eiechorn 60 is a fine choice for the way we used it. We used it as a mountaineering pack that saw us on the same trails in the Summer as we will be on next winter. Even day-trip gear can weigh-up significantly, depending on what we were trying to accomplish. The point is that the Jansport Eiechorn 60 is extremely versatile as a support system for getting up and into the backcountry for a day or two. Comfort and fit is vital when it’s all uphill. comfortable backpacks, right out of the box, this writer has experienced. The variety of load weights varied from hike to hike, but the comfort has consistently rated an 11 on the big Marshall stack volume knob. It’s this comfort, fit, and finish, in addition to physical cargo capacity, that we can objectively recommend to consumers researching their next mountain ruck. You’ll want to determine if the Eiechorn 60 (Regular size) is right for your torso length, or if the Eiechorn 70 (Tall size) is what you need. As the main evaluator, I should have gone with the Eichorn 70 because I’m 6’2”. Yet, the regular size Eichorn 60 still just felt like a baby monkey on my back on each trip, and the weight seldom mattered. Even when really trudging and physically feeling the altitude and level of exertion the body was going through, shedding the pack for a break was not my first inclination. The pack weight is what it is, the comfort and fit is outstanding. I would just rest, with the pack on, and move forward when I was ready. Rarely did I feel the need to take the pack off to rest on the trail. The Eiechorn 69 was that comfortable for me, and the fit is a benchmark I assess all backpacks by. You’ll appreciate the ice-blue anodized aluminum tube frame stay referred to by Jansport as their Arch Rival system which gives the Eichorn a sturdy skeleton to support the weight and distribute that weight evenly on the back. Because the Eiechorn is designed to manage the load weight, yet move with the body as you navigate rocky, uneven trails, the burden stays with the pack, not your back. The Arch Rival pack suspension system, including the adequately padded shoulder straps, hip belt, lumbar padding and adjustability easily allows the hiker to fine tune the fit. It’s that fit capability of the Eiechorn that jumped out as an indicator of how far Jansport has come in demonstrating best-practices in pack design and their knowledge of what people need in a high-quality backpack. The lumbar pad cushions the tail-bone area and works nicely with the hip-belt to take some weight off the shoulder and distribute the load. Eichorn’s roll-top, top-loading design seemed a bit awkward at first, but with use, it became a welcome feature. The roll-top is quick to use, allowing you to fling the top cargo pocket back, grab your wind parka, and secure the c-clips…just like that. On the trail, when you need to dig into the pack to grab your stove for a lunch-break, the side-zip access makes it no drama. The top pocket not only functions as the weather barrier for pack contents, but it is large enough to keep your topographic map, compass, headlamp, and all the smaller gear you might need while on the trail. Jansport Eichorn 60 side pocket with Mt. Hardwear Hydra gloves. Also easily accessed is the large front pocket designed lengthwise to provide enough vertical space to store a multi-person Adventure First Aid kit, Mt. Hardwear mountaineering gloves (that go everywhere), and a Marmot Hyper jacket shell. Convenient storage for your cell phone, GPS hand-held device or .25 cal. Derringer is located on the waist belt. Also two water bottle pockets stake out each side of the pack. Although water bottle pockets seem irrelevant these days with the omnipresent use of hydration bladders, they are still handy when you need to carry extended capacity water containers. Exterior design is thoughtful. Abrasion and weather resistant TPE facing material is used for the exterior of the top pocket, front pocket, and the bottom of the Jansport Eichorn 60 backpack. On alpine day hikes, we often take the chairlift up as far as it will take us when we’re scootin’ around a ski resort in the summer. Just before the chairlift lines up with your waiting body, you have to literally toss the backpack to your left, plop it into the chair, as you settle your own body while the lift continues its way back up, or down, the mountain. We do this a lot. So any pack that is on the trip takes some real tossing around. Grab handles on the top of the pack, and bottom sides, are rope-strong, and makes situating your pack while loading it up, or taking it off, very reliable. Lash points and hypalon lashing ovals offer you every means of carrying your ice-axe, crampons, skis, or snowboard. And there are enough lash-points to secure your snowshoes, if that’s your transportation for the day. Quality of workmanship, stitching, and choice of strap-gauge are consistent with a lightweight design. The plastic C-buckles on the shoulder straps, waist belt, and load-straps are sufficient. They are sturdy, and did not cave-in to hard use and sometimes less-than kind handling – you know, like how your luggage is treated by every airline baggage handler on this planet. 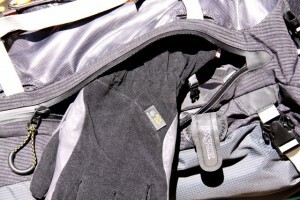 The Jansport Eichorn 60 stood up to the late winter, and all Summer-long for 2011. In general, the Eiechorn 60 is a workhorse of a mountaineering approach pack. You can haul all the rope and hardware you need for a day trip. You can pack essentials and truck it for an overnighter just to live outside on a full-moon, with Neil Young and Pocahontis playing through the IPod as you fall asleep leaning up against the trunk of a Ponderosa pine just below tree line. It’s a great backpack and it’s a sound investment in this writer’s view. The Eiechorn 60 get’s used often, and that can’t be bad. Dimensions: 29.5 in. H x 11 in. W x 11 in. D.
RMSP Range: about $200.00 U.S. depending on your source of purchase. Eichorn 60 EVA molded back panel is well padded and breathable. Note annodized ice-blue tubular aluminum premiter stay. TPE facing material shields pack against abbrasion from the ice-axe, exterior gear, and life itself. I’ve used this backpack in the Grand Canyon, Glacier National Park and many more places!